Parents remember the glory days of playing outside from the moment the sun rose until when the street lights came on. Unfortunately, in today’s world, children are so involved with electronics and they don’t necessarily get the same outdoor experience that we did back in the day. It’s important for children to spend time outdoors, not only because it’s fun but because it’s good for their health and overall development. When out soaking up all of the sun, they’re gaining that vitamin D which is important for the body. It’s also proven that vitamin D makes people happier. While they’re running, playing and exercising, your children are reducing stress and strengthening their muscles. It doesn’t matter that there’s no plane involved; kids love parachutes. 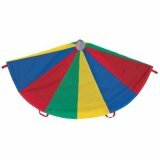 This six-foot multi-colored nylon ripstop parachute is a fan favorite across many classrooms and households. With eight double-stitched handles and a mesh center, this product is easy for children to hold onto, and stays safely ventilated even when children are playing underneath the fabric. Make fast waves, make slow waves, throw a beach ball in the middle and bounce it around together, or throw the parachute up in the air and sit on your handles to create your own secret circus tent. 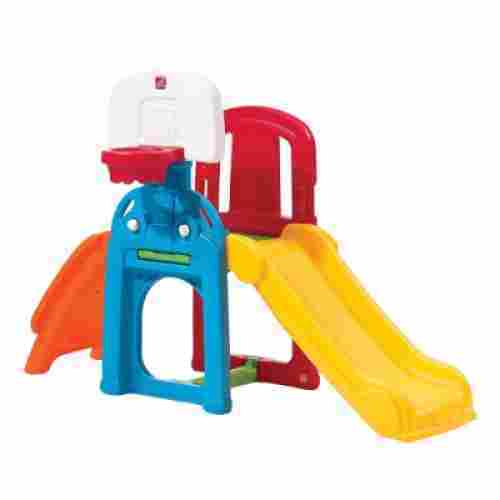 Made to last, this Champion Sports ‘chute is good for loads of giggles. Teach kids teamwork, taking turns, and basic motor skills with this multi-functional toy. Kids will love running under it, sitting on top of it, hiding under it, and making ripples with it. There’s no doubt that bubbles are a classic toy that kids love. The WOWmazing 3 piece Bubble kit takes playing with bubbles to the next level. The kit includes a giant bubble wand, bubble concentrate, and a booklet containing tips and tricks. The two handle design of the bubble wand creates long giant bubbles. This bubble kit is perfectly safe to use for kids all of ages. However, don't let them eat it - no matter how much fun they are having! We love that kids will be in awe as they create bubbles that are bigger than themselves. 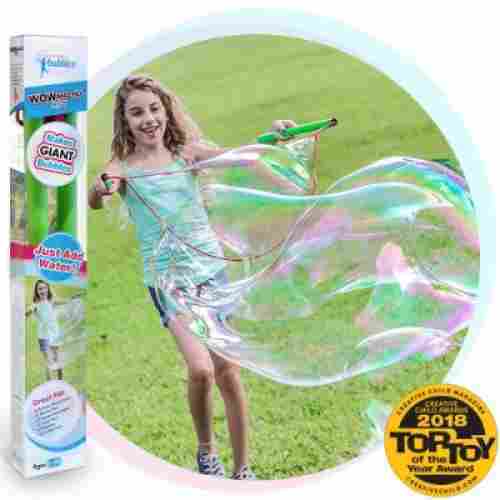 Children of all ages will have a blast creating, chasing, and popping the bubbles from the WOWmazing kit. 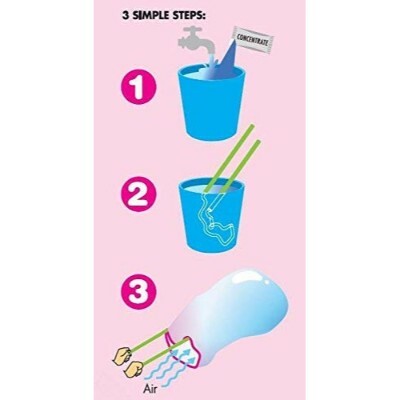 The WOWmazing kit encourages social play as kids will have a blast blowing bubbles together. Your kiddos will gain plenty of exercise as they run to pop the bubbles. Gripping the wand will strengthen their fine motor skills. Playhouse is not anchored to the ground. While your hosting your annual summer BBQ, your kiddos can host one of their own with the All Around Playtime Patio. The patio includes three main stations; the grill station, the snack table, and a sand/ water play area. The Sand and Water area provide several toys for children to stimulate their senses. 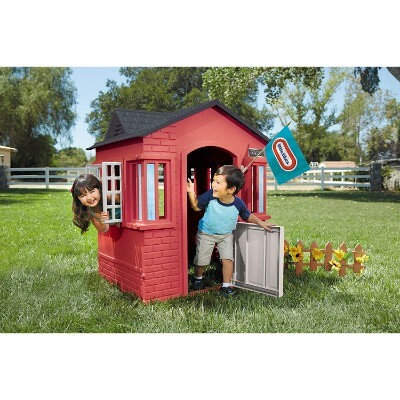 Complete with a canopy, your child can enjoy hours of fun in the playhouse on even the hottest of days. And there is no real heat for cooking, so it is perfectly safe to play pretend! The grill station is equipped with a sink and swivel faucets which will surely make your child feel like a true grill master. 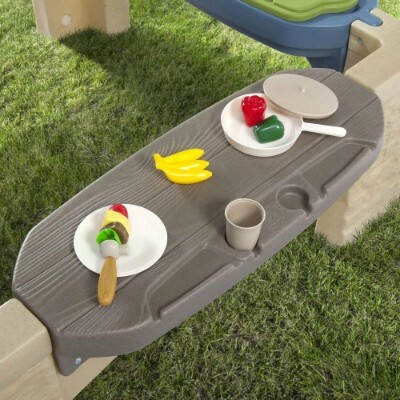 The snack table provides a dish set so your child’s friends can pretend to eat what he or she cooks up! 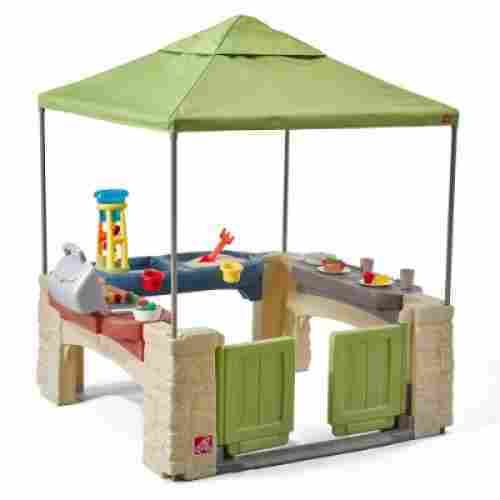 The All Around Playtime Patio will foster a love for the culinary arts in your child as they engage in pretend play. They will improve their sensory development as they experience the elements of the sand and water area. With three stations and plenty of space, your child is encouraged to engage in play with others. 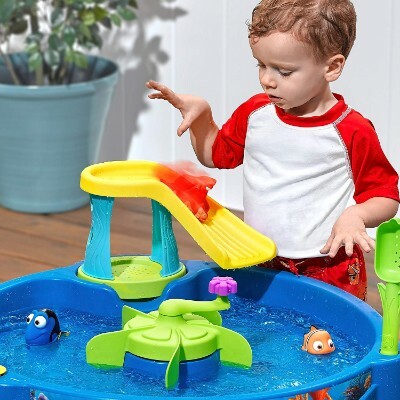 Just keep swimming, just keep swimming...or, if there’s no pool and the sun’s beating down, all the same, set up this delightful Finding Dory Water Table in the backyard and watch your kids splash around. Send Dory and her friends down the slide and into the open waters below. This item is perfectly safe for kids and adults alike. 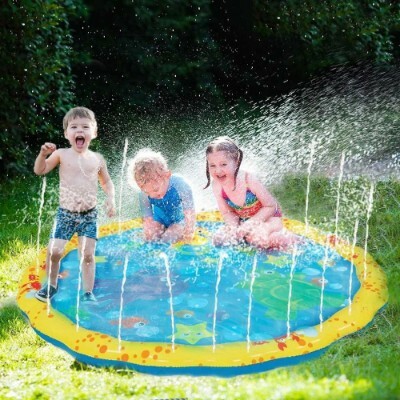 Plus, it is sure to keep the whole family cool and occupied during the warm summer days. Use the windmill to propel them around the pool, or catch them in the cattail scoop. Clip the springboard onto the side and watch Dory and Friends go diving into the ocean! This table is a fun tribute to her and her friends that will keep kids cool through warmer seasons. It is made of durable plastic and the characters are of good quality. Plus, they're absolutely adorable! Water tables teach children basic developmental skills such as for cause and effect, fine motor skills, and creative play. Dory is a great character for kids to swim along beside. She’s kind, works hard, and loves with a big heart, teaching us the importance of patience with ourselves and others. 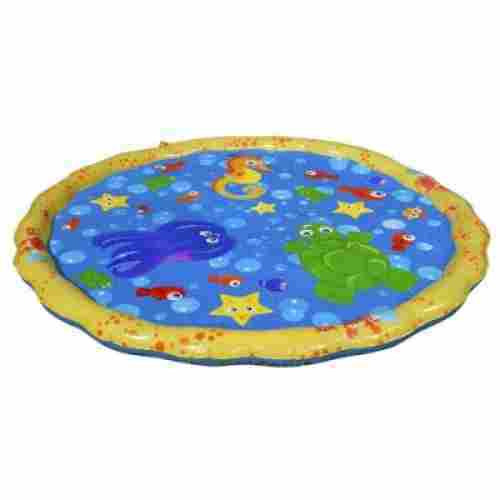 The Banzai Sprinkle and Splash Play Mat is the perfect outdoor toy for when the sun is blazing in the summer. The mat is 54 inches in wide and equipped with sprinklers on the outer edges. Attach a hose to the mat. Allow the water to keep running. It will gently shoot out of the sprinklers and fill up the pool area. ALWAYS watch your kids when water is involved. We love that the Sprinkle and Splash play mat is versatile in that you can use it with the sprinklers or just as a little pool. The mat will keep your child cool in the sun while also stimulating several areas of their development. Once the little pool fills up, it will hold. 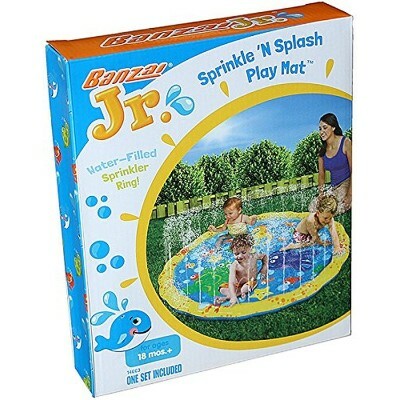 Whether you keep water running for the sprinklers or turn it off and just use the pool your child is sure to have a blast in the Banzai Sprinkle and Splash Play Mat. Once your child is done splashing around, empty the mat and hang it out to dry. The mat dries easily which will prevent mildew and keep it in great condition for future fun in the sun! The Sprinkle and Splash Play Mat is big enough to fit more than one child! Hosting playdates with the play mat will increase your child’s social development. The brightly colored sea creatures on the mat will aid in your child’s sensory development. For the tots who are sitting but not quite walking, the sprinklers provide tons of stationary fun. The Sprinklers will stimulate the development of your child’s hands as they reach and try to grab the water. It’s a hoop, it’s a climber, it’s a goal post, and it’s a slide, all in one. 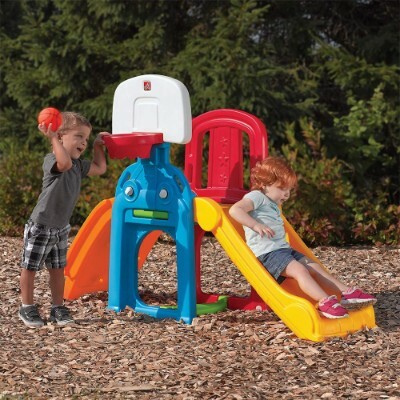 This Step2 playset will keep kids active for hours as they climb up the patterned “rock wall” in the back, slide down the front, and shoot hoops or score soccer goals from off to the side. The set comes with a built-in way to keep score in case they’re playing with buddies, is made of safe, durable plastic, and can hold up to 66 lbs at a time. It is safe for all kids to play and have fun! It’s the swiss army knife of toddler playsets. It has multiple features and can be used in versatile ways to keep kids occupied for hours. Children can practice aim, coordination, and dexterity while building muscle on this combination jungle gym and sports center. The crawl space on the bottom of the structure doubles as both a fun escape route during tag and a small goalie area for kids to practice kicking the ball. 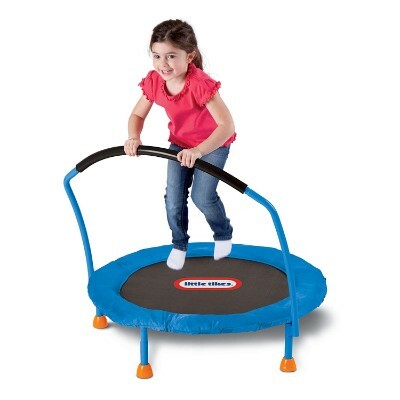 To develop balance and leg muscle strength in your kids, you will need the 3-foot Trampoline from Little Tikes. While the manufacturer says the trampoline should be used indoors only, it can also be used in your backyard provided you have an even and level surface. 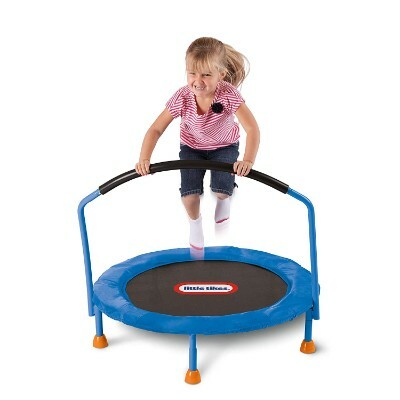 The 3-foot-diameter jumping surface is perfect for small legs. The trampoline comes with a center handle bar so your kid will have something to hold onto while jumping. If you like this, then check out our article on the best trampolines for kids here. Made with tough, durable materials, this trampoline is great for fun outside. The spring may be subject to rust if left out over the seasons, but it can support a large amount of weight. Jumping on this trampoline is fun and exciting for any toddler. It quickly burns off energy while building leg muscles, adding balancing skills, promoting better fitness, and helping with coordination. The trampoline also offers the benefit with the stabilization bar for the arms to be used to help balance. This is a great way to help promote gross motor skill building while having fun. Going to the beach is always fun for kids. 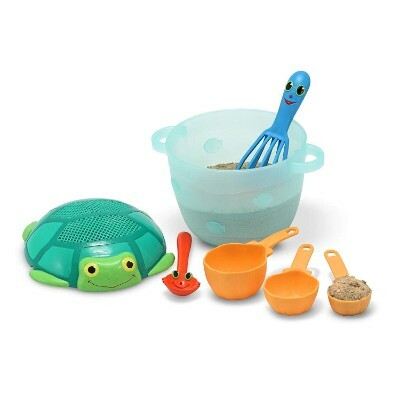 Playing in their sandbox can be equally exciting especially if they have Melissa & Doug’s Sunny Patch Seaside Sidekicks Sand Baking Set. What better way to explore a toddlers passion for cooking than through their imagination. This set is safe and easy to clean, so your kids can use it for years to come. Made of durable plastic, you can introduce your kids to replicas of real-life baking utensils and they can be well on their way to becoming the next great baker. 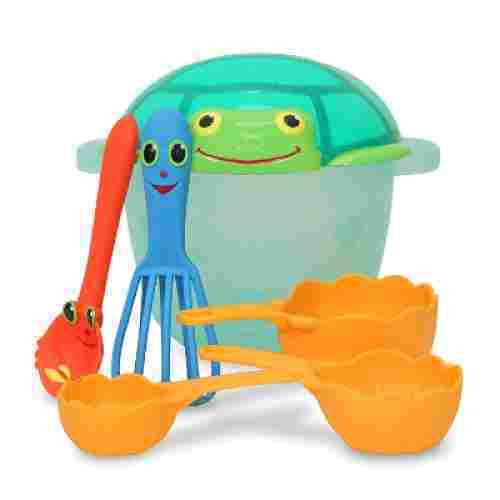 Your kid can already play with measuring cups, mixing spoon, wire whisk, and a mixing bowl that doubles as a sieve. 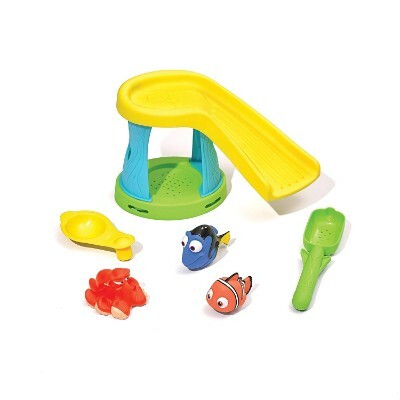 This sea creature inspired play set offers fun while sparking a toddler's imagination. Playing pretend and encouraging sensory play is a wonderful way to engage with a toddler. The shell-shaped measuring cups can also be used to learn simple math while encouraging their minds to imagine up some great treats. 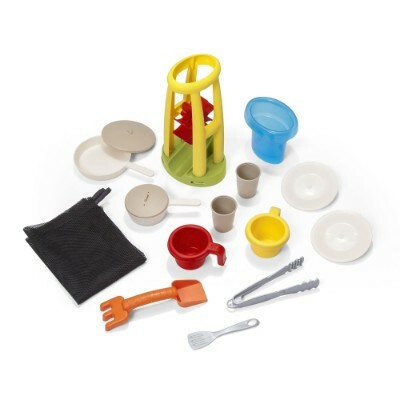 This is set helps hand-eye-coordination and learning the purpose of many tools used in the kitchen. Excellent for pretend play, toddlers will appreciate the almost-realistic Cape Cottage. This can be an amazing addition to one’s garden and play area landscape complete with fully-functioning doors and windows. It also has flag holders and mail slots. The Cape Cottage comes in two colors, red and tan. This cottage can be used both indoors and outdoors for fun playtime experience. 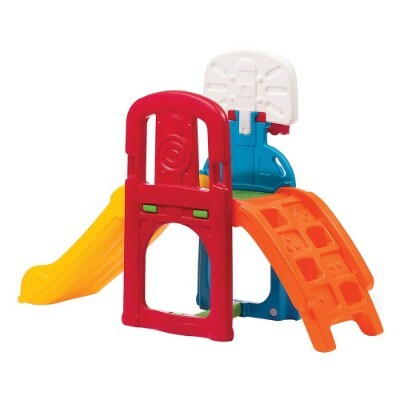 It is made of hard plastic and does not include many small pieces, so it great for all ages. Despite its size, it is lightweight so moving it from place to place is a breeze. This is great for encouraging imagination from your kids. 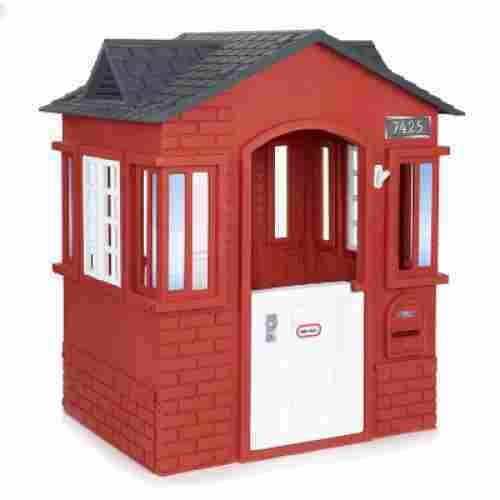 Toddlers can play along or with others in this fun house with two working doors and 2 windows with working shutters. Using the doors and windows promotes hand-eye-coordination. The cottage also encourages a toddler’s imagination through pretend play. 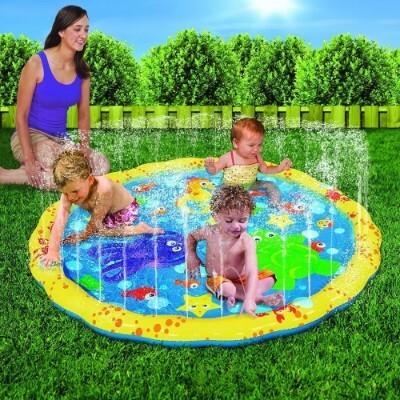 Perfect during the warm summer months, the Play and Shade Pool is your kid’s own private swimming pool. The Play and Shade comes with an umbrella stand to provide your kid shade while at play. 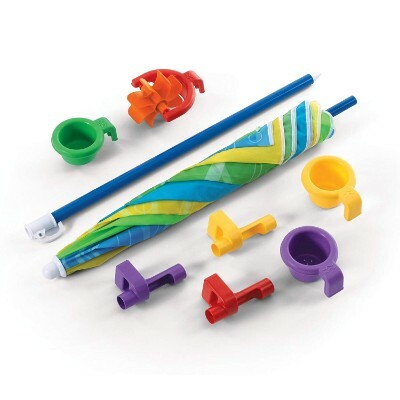 You can attach 3 funnel cups as well as a water wheel to the umbrella post for more fun while playing. The bottom of the pool has molded-in designs to allow for excellent traction for kids’ feet. This can help ensure they won’t slip and hurt themselves. It is safe for many ages, but kids should always be monitored near water. 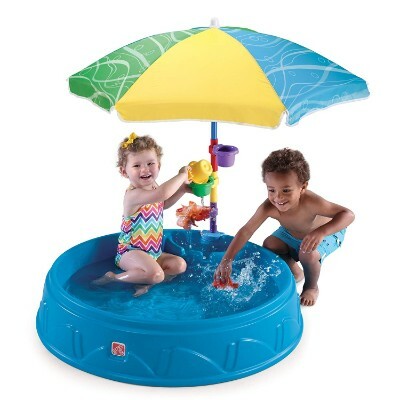 This fun in sun activity play and shade pool is great for toddlers to enjoy the summer months while cooling off. 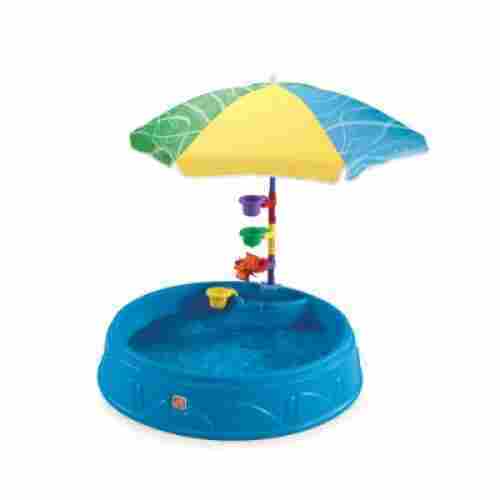 The pool comes with an umbrella stand to help shade toddles from the direct sun and also has a molded design on the bottom that helps with traction. 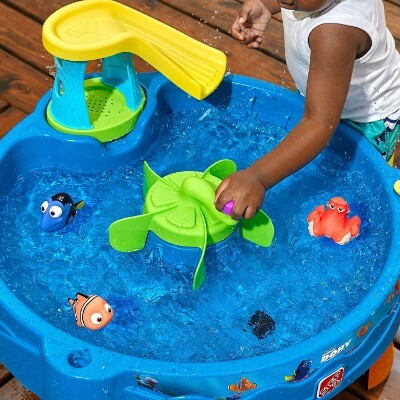 Water play help encourages pretend play. 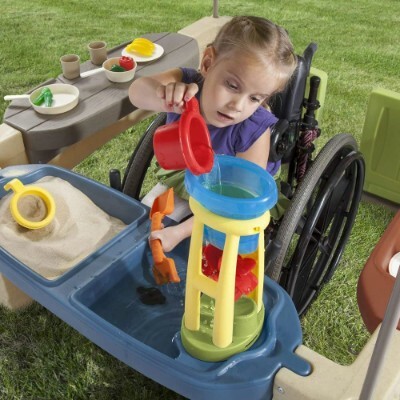 Included with the pool are 3 funnel cups and a wheel that spins that encourage gross and fine motor skills. This pool allows for hours of fun with. A top priority for us was safety. While parents still should always keep an eye on their child, most of the products that we have listed are perfect for pretend play. It is also recommended that when looking for a toy for their child that parents also take a look at the recommended age for the toy before purchasing to make sure that it’s age appropriate. We also suggest that parents inspect the toy for sharp edges or damage before giving the toy to your child before play time. While it’s not likely that your product will get damaged during delivery, it is possible that it can happen. 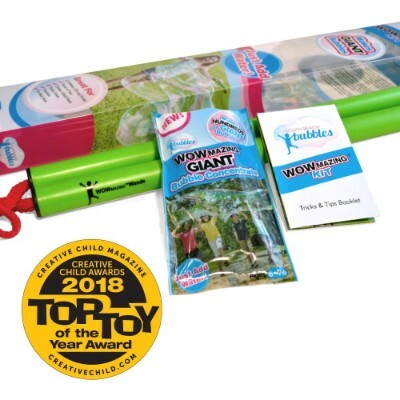 When we sat down and began to create our list of the best outdoor toys, the toys chosen needed to be suitable for the outdoors. We made sure that each toy on our list could withstand any condition that Mother Nature could surprise us with. 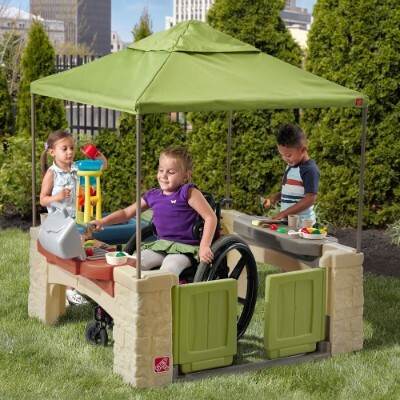 We wanted toys that could provide shade which is a huge plus as they ensure longer outside time on those hot summer days. 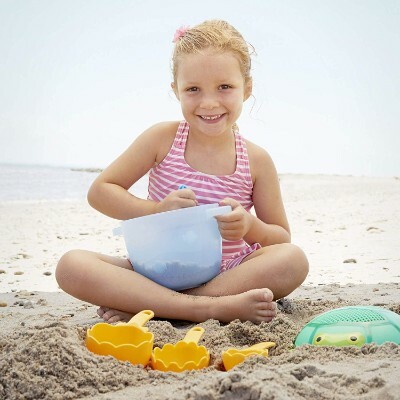 Toys that encourage toddlers to play outdoors and use pretend play help their development. They need their gross- and fine-motor skills challenged while also encouraging their imagination. Playing outdoors allows toddlers to explore nature around them while running, jumping, and navigating the different terrain. This encourages balance and gross-motor skills. Adding toys to encourage fun outdoor play also allows them to explore their imagination while refining their skills. We love our toys and some even offer a perfect outdoor play to help your child stay cool when the sun is hot, hot, hot. There are also several toys on our list that are extremely lightweight, which makes it easier for parents to move them. Even though many of these toys can withstand the rain, we recommend bringing them inside during severe weather just to ensure that they will last longer. By doing this, it also prevents rust. Children shouldn’t play with toys that have accumulated rust as it is a definite safety hazard. Several of these toys are also versatile so your child can play with them indoors as well, so even if there is a rainy day, your child will still be able to play with their favorite toy. 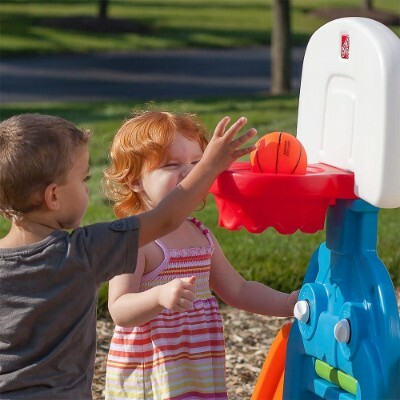 Many backyard toys are specially designed to encourage and promote the skills that toddlers already have while also giving them new skill sets as well. It is important for physical and mental development for toddlers to play outside while also inspiring their imaginations as well. Water play, pretend role-playing, and using games to exhaust their energy are added benefits of outdoor play. The toys on this list are researched for their price, features, and age range. We also review safety ratings for each toy and we want to make sure that anything on the list is the best and safest for the toddler using them. We review parent’s feedback for many toys and only select toys that their toddlers are currently using and enjoying. We always consider those things when adding to the list. We feel confident with the toys selected on our list. Each toy has an appropriate age rating and encourages the development of a toddler. When toddlers play through pretend it encourages their imaginations while stimulating both their physical and intellectual development. It also teaches reason and problem-solving techniques. When a child is faced with a question or feeling during pretend to play, it helps how they would deal with the issue in real life. It helps them create empathy and a way to sort out their feelings. When others join in on the play, it gives them a new layer of complexity. It helps to define roles, helps with communication between peers, and develops stronger social skills. q: What is the best way to encourage toddlers to play outdoors? Toddlers are mastering their new-found sense of independence with their ability to walk, run, jump, and play. Being outside allows toddlers to explore new things while developing their sense of smell, sight, and muscles. When playing and pretending outside, they are able to explore the natural world around them while practicing balance and coordination. Encouraging outdoor play helps toddlers become more successful preschool and school-age children. q: How do you know if the toys are challenging toddlers physically? Toddlers are physically challenged when using their coordination skills, fine- and gross-motor skills. When a toddler is developing, it is at a rapid rate. Being able to encourage toddlers to pour water into a funnel, kick a ball into a goal, and balance while completing an activity are many great ways to challenge them physically. You will see them building and refining the skill set each time they use the toys. They will soon master the skill and move on to something more challenging. It is important to encourage and play alongside with them. q: How do you know if the toys are challenging toddlers mentally? Understanding logic and self-control are two of the biggest challenges for a toddler. As a parent, it is your job to help them learn and experience these challenges. Using toys that encourage logic and self-control is a good way to help them develop these skills. When you see your child acting out pretend play or sharing during playtime, this displays mental growth for a toddler. When you see them meet and exceed a challenge you know they being mentally challenged. q: How do I know if the toys are safe for my toddler’s age group? To make sure that the toy is safe for a toddler’s age group you must check the label of the toy. By law, each toy manufactured must have a label that states the age group that the toy is safe to be used by. This label must be clear and easy to find. So make sure to check over each toy before purchasing. If purchasing the toy online, most retailers will include the age rating in the details of the item. q: How do I find the toys listed on the list above? The easiest way to find the toys listed on the list above is to use a search engine on the Internet. Simply type the name of the toy that interests you in the search engine and it will return the results of where the toy is sold. Many major retailers have websites and many can tell you where the toy is located if you are interested in buying it physically and they often make it very easy to buy right there online. q: How do I know if my toddler has outgrown his current toys and is ready for something new? You will know that your toddler is ready for a new set of challenges or toys when the current toys are no longer being given their attention. Often toddlers will no longer play with a toy or their attention span with the toy will lessen when they are ready to move on. Sometimes more times than not, more is less. Try either removing the current toys for a couple of days or having a rotation of toys. When you see them losing interest, also try to re-engage with them, maybe even showing them a new feature with the toy or playing with it in a different way. When the table is no longer engaging, you could switch the water for sand.